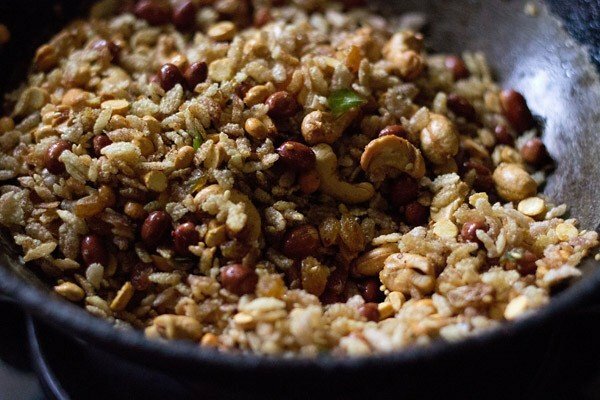 poha chiwda recipe - crisp, crunchy, sweet, savory and mildly spiced mixture made with rice flakes or poha, dry fruits and spices. thick poha chiwda recipe with step by step photos – chiwda (chivda) is made by many families during diwali. basically chiwda or namkeen as we call, is a savory sweet or spicy mixture. there are many variations of making chiwda. 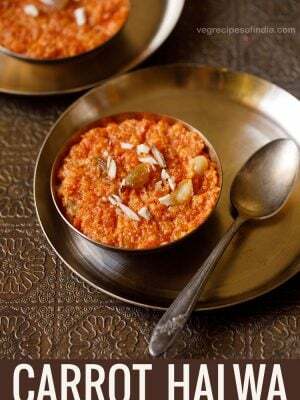 this recipe makes use of thick poha or aval (flattened rice), dry fruits and spices and is a maharashtrian version. i have skipped adding coconut slices in this one as no one likes the coconut slices in this fried mixture. if you like you can add them. most of the times i get packs of haldiram’s chiwda mixture as i am too lazy to make them. 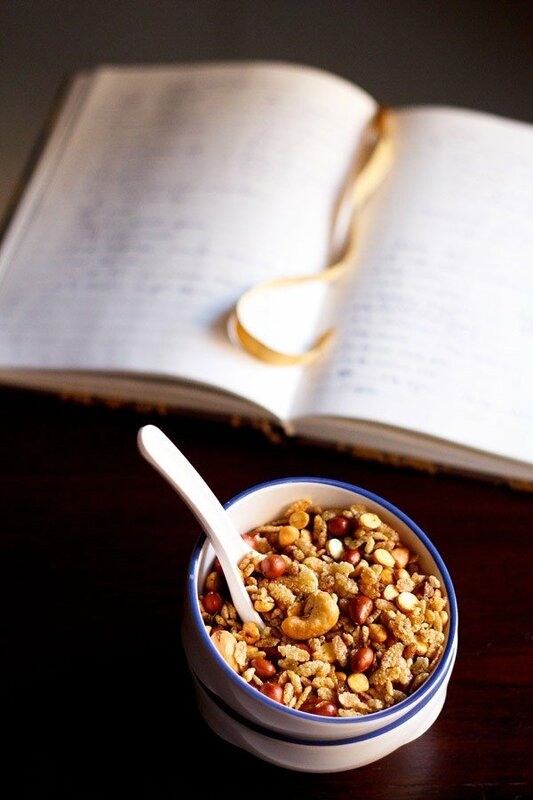 i munch on them when reading a book or when scribbling notes. 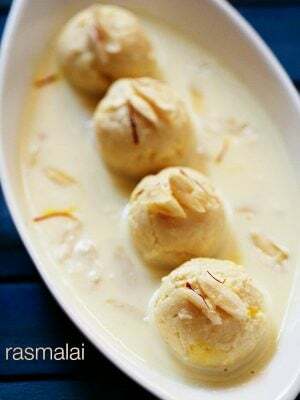 i got a request to post a namkeen recipe and hence made for the upcoming diwali festival and posting too. 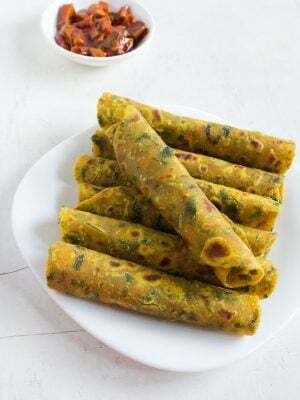 this is a mildly spiced sweet and savory chiwda. you can alter the spices as per your liking. when making chiwda with poha or corn flakes or grated potatoes, always use a fine sieve ladle. in indian markets we get these sieve with a handle and they are very helpful for frying ingredients which have small pieces or flakes. just one equipment makes the frying process easy and a breeze. so you don’t waste time and energy trying to find out the rice flakes or the chana dal in the oil. this cooking process requires a bit of planning. so keep all the ingredients ready. also line two to three plates or bowls with paper towels. the sieve should be dry and so the ingredients. you will be frying everything one after the other, so the prep works helps and is efficient too. 1 cup thick red or white poha (aval, flattened rice) or add as required. you can easily increase the quantity to ½ or 1 cup more, in case you want to have more of the poha and less of the dry fruits. first rinse the curry leaves, cashews and raisins. dry them in a clean kitchen towel. heat oil for deep frying in a kadai or wok. 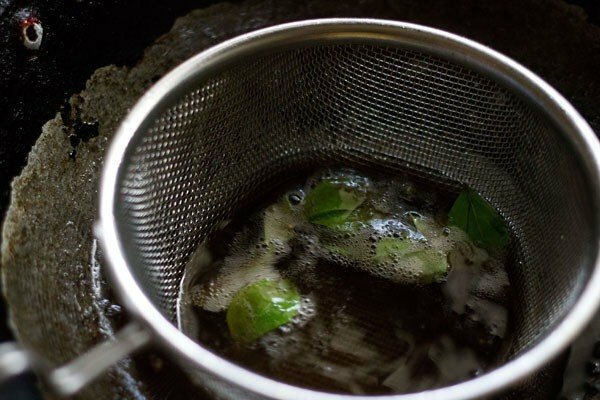 take a fine sieve with a handle. place half of the poha or rice flakes in it. 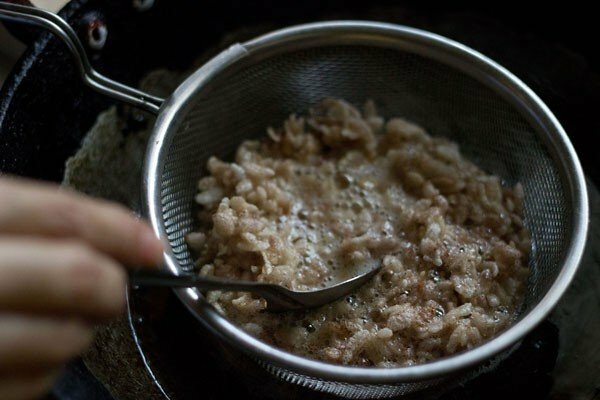 immerse the sieve with the poha in the medium hot oil. fry till they expand and become crisp. don't brown them. remove the fried poha on a plate lined with paper towel. place the sieve on a dry plate. add the remaining poha in it. again keep the sieve with the poha in the hot oil and fry till they are crisp. drain them in the same plate. next add the chana dal in the sieve and fry them for some seconds till they become crisp. 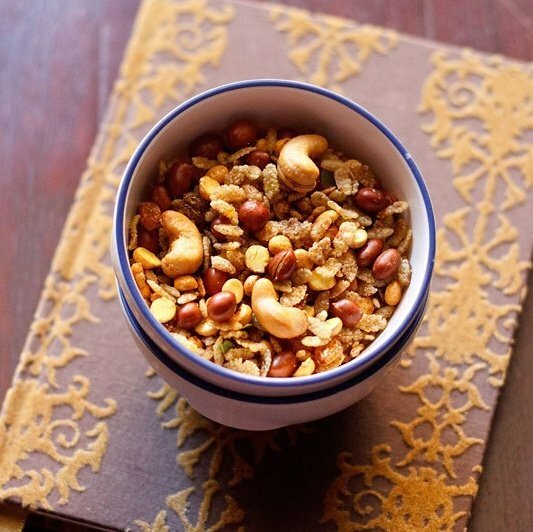 in the same way fry the peanuts, cashewnuts, raisins, coconut slices and curry leaves. keep all of them separately in a same plate or in separate plates or bowls, lined with paper towels. heat 1 tsp in another pan. first add the mustard seeds. let the mustard seeds pop. then add the cumin and sesame seeds. let the sesame seeds pop and change color. switch off the flame. add the turmeric powder, red chili powder, asafoetida. stir and now add sugar and salt. 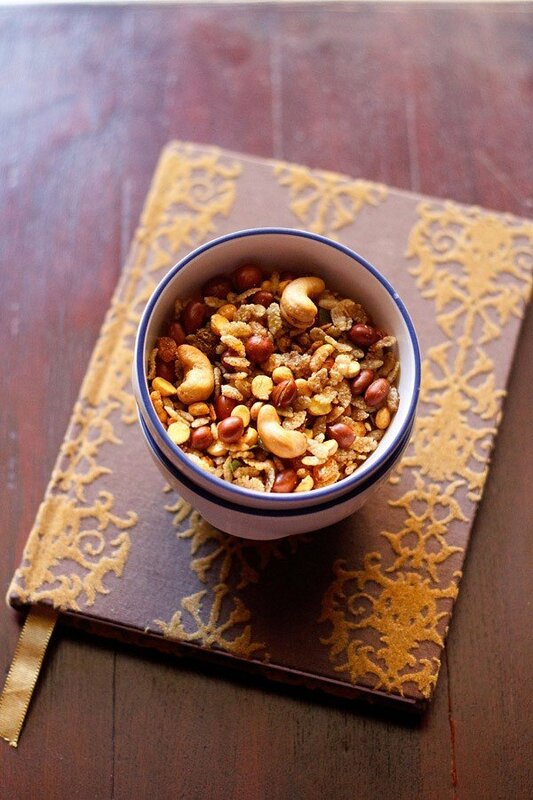 stir and switch on the flame and add all the fried ingredients - poha, peanuts, raisins, cashews and chana dal. stir well. crush the fried and crisp curry leaves and add them to the chiwda mixture. stir well and roast for 2 to 3 minutes on a low flame. continue to stir in between. check the taste of poha chiwda mixture and then add more salt or sugar or red chili powder if required. 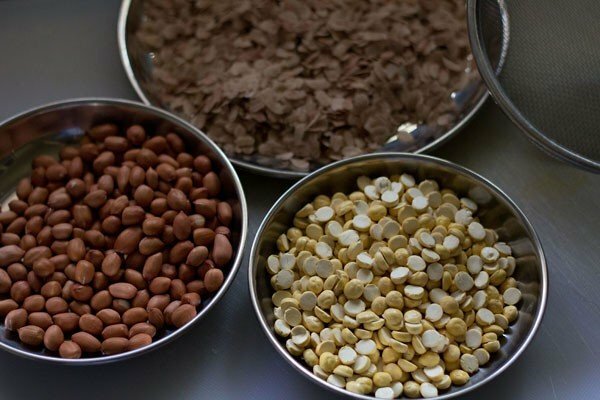 let the chiwda mixture cool and then store in an air-tight box and container. serve the poha chiwda as a tea time snack. 1. first measure and take all the ingredients and keep them in individual bowls or plates. 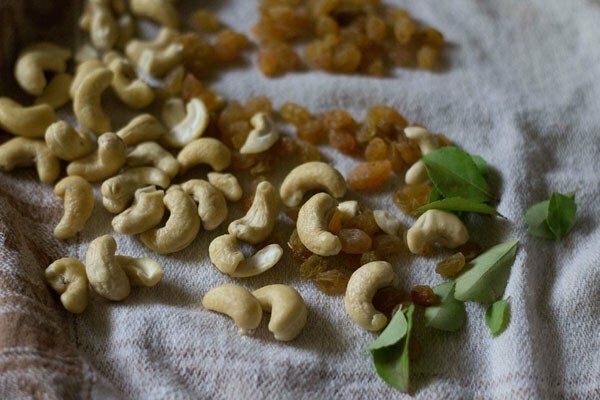 2. rinse the cashews, raisins (my habit to rinse both of these every time) and curry leaves. dry them in a clean kitchen towel. 3. heat oil till its moderately hot in a kadai. take half of the thick poha first in the sieve. 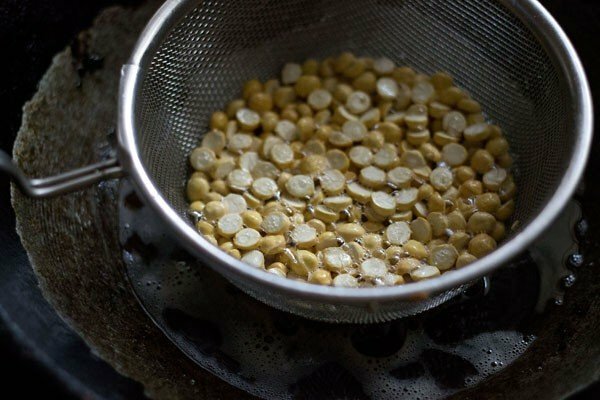 immerse the fine sieve ladle in the hot oil and fry the poha till they expand and become crisp. don’t brown the poha. i have used red poha. 4. for even frying you can stir with a spoon. 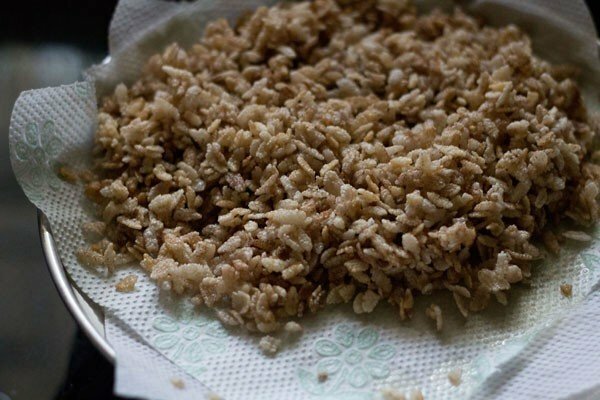 5. remove and drain the poha on a plate lined with paper towel. 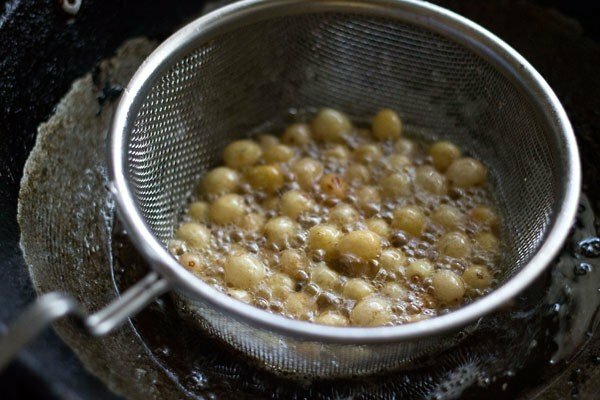 6. same way take the roasted chana and fry in the oil till they become crisp. just for some seconds as they are already roasted. 7. drain on another plate lined with a paper towel. 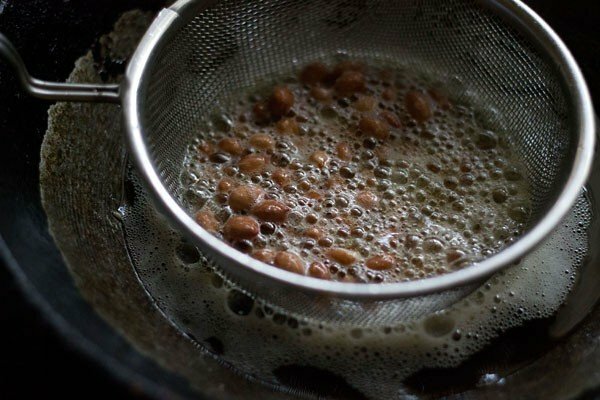 8. same way fry the peanuts till crisp and crunchy. 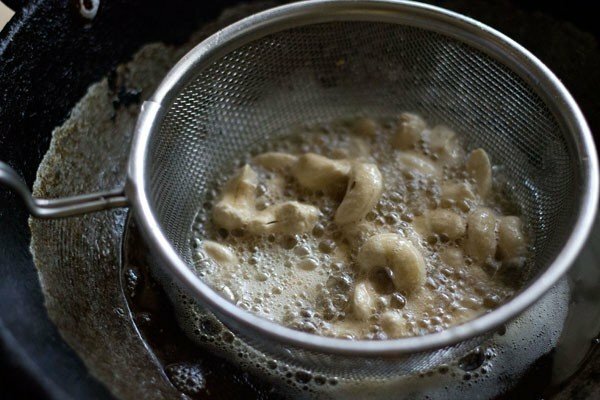 10. fry the cashews till light golden. 11. drain the cashews too. 12. next come in the raisins. 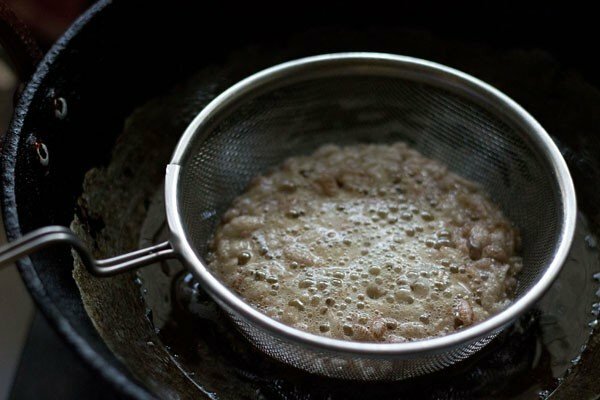 13. just fry till they become plump and swell. don’t fry more as they become dense and chewy. 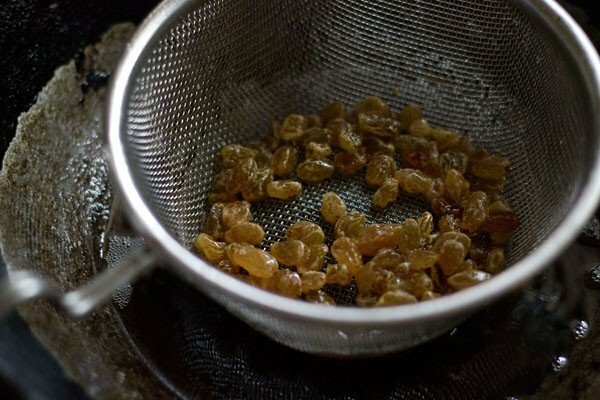 14. drain the plump raisins. 15. fry the curry leaves also the same way till they crisp. a few seconds. drain. 16. heat 1 tsp oil and crackle the mustard seeds. add the cumin and sesame seeds. fry for some seconds and then add turmeric, red chili powder, asafoetida. sugar or powdered sugar and salt. stir well. 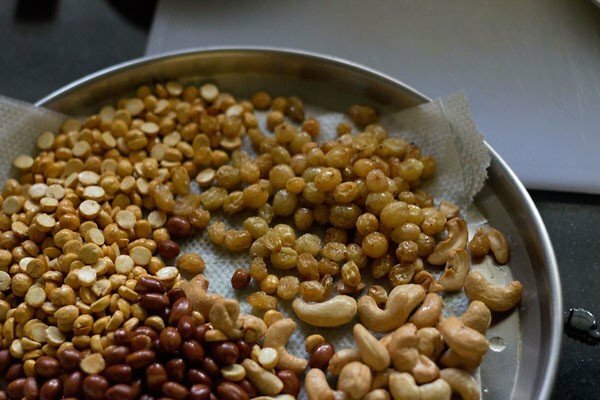 17. add the fried poha, peanuts, cashewnuts, raisins, chana dal. crush the fried curry leaves on top. stir well and roast for 2 to 3 minutes on a low flame. continue to stir in between. check the taste of poha chiwda mixture and then add more salt or sugar or red chili powder if required. once the poha chiwda mixture has cooled, store chiwda in an air-tight container. 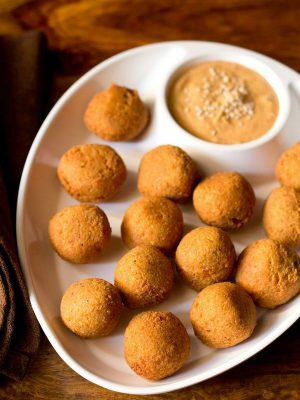 serve chiwda whenever required as a tea time snack. dassana,it was a pleasure sharing this tiny info with u.do give it a try when possible.my mom has been using this technique for around 55 years.it gives a lovely lemony tang to the chivda.she does not add curry leaves & coconut but she adds cinnamon & cloves whilst tempering it & in addition she also adds potato sali/wafers,deep fried gr.chillies & chana dal & rest of the ingredients remain the same. thank you meveera. i will give a try. i should also try adding cinnamon and cloves like your mom. i am wondering about the aroma and flavor they will give in the chiwda. thanks again meveera. 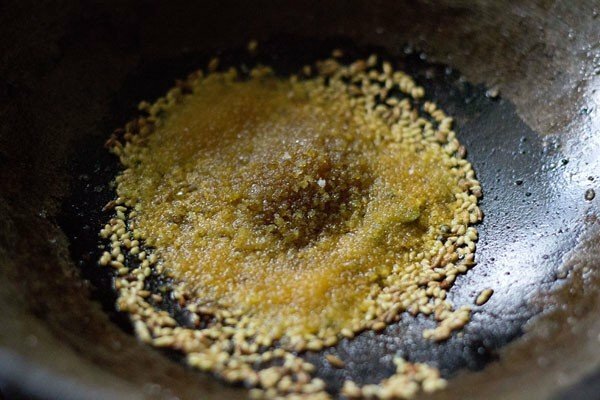 hi dassana!just wanted to share an info.that u can also add the flavour of lemon to chivda simply by heating lemon juice in little oil & cooking it till it starts to sizzle thereafter adding it to prepared chivda & mixing it thoroughly.this has been practised many gujarati women in east africa for years. thank you meveera for this awesome suggestion. i always add amchur powder for a bit of sourness. also i would always wonder how to get the lemon juice tang as i do not use citric acid. and could not figure out how to get the lemon flavor in chiwdas. the sourness from amchur is quite different from the tang of lemon juice and i feel lemon juice does taste better than amchur in chivda recipe. thanks again. 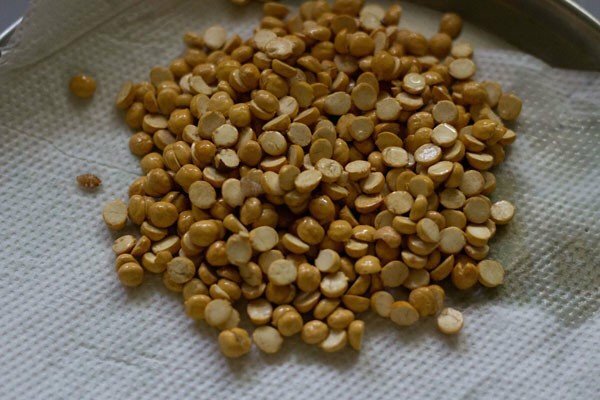 It is a method used by some street vendors for roasting not only peanuts but also corn kernels (to make pops), puffed rice etc. Actually we were thinking if we can enact that at home using salt but I don’t know the salt type to be used for that. Can I go for sendha namak? Or some other variety is to be used? yes ruchi, both methods work. roasting can be done without salt too. the street vendors use hot sand for roasting.i think they use sea salt crystals. at home we can use tawa. for puffing corn, what i do is heat a cooker and place the corn kernels in it. close the lid with just letting a bit of steam pass through. keep on a low flame and the corn kernels will start puffing up. you can also do on a tawa. i don’t use salt as i feel salt can always be added later. 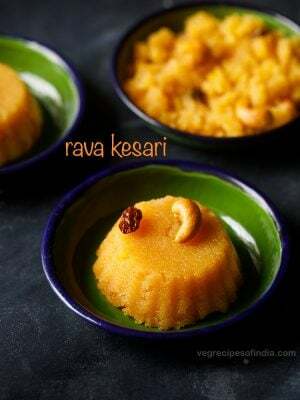 This year I am so interested in these special festival recipes that you have created. They are very nice indeed. Welcome Jan, Happy Lord Ganesha Chaturthi to you as well. Made this yesterday night. It’s awesome. The only changes I want to make is add more poha, because the fillings are two much. Still we as a whole family and my friends loved it. Thank you. Sir, what if we have to cook large amount of chivda say 2 kg,is it necessary to fry it all?? no. you don’t need to fry all. if you use thick poha, then you will need to fry it. 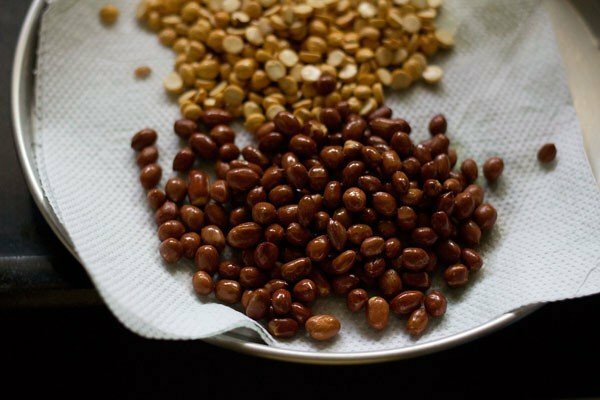 the rest of the ingredients can be roasted dry or with little oil. for thin poha, you can just roast in kadai with little oil. 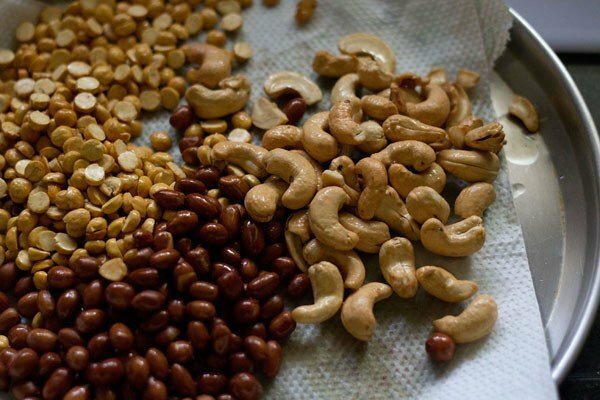 the peanuts, cashewnuts and chana also you can dry roast or roast in little oil. Thanks alot… i have decided to prepare some namkeen for my boyfrnd and thus confused how to prepare tasty namkeen with lots of tasty ingredients which will support the whole namkeen… after going through ur given receipe i am very confident that my boyfrnd is going to love it. welcome geeta. glad to know that the chivda post was helpful to you. Never made chiwda at home before, but remember my friends getting homemade chiwda when I was in hostel. 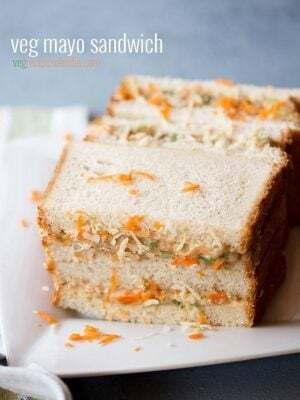 I am going to try this recipe, pinning it for now. I lived in pune for about 10 months… I had chiwda numerous times.. I loved it.. 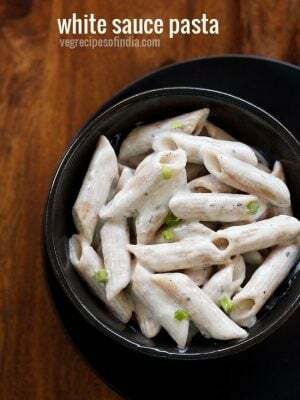 I was looking for the recipe everywhere.. now i got a step by step recipe.. thanks dassana.. I always find it hard to restrain myself from eating this chiwda but I manage it at times coz I avoid eating fried stuff but at my in-laws house it is devoured by everyone!